DroneDayBoston – Indoor racing comes to Boston! What happens when you combine rainy spring Boston weather, a lot of hard work by organizers, and a nifty indoor industrial space? Why, you get Drone Day Boston, a part hobbyist, part social, part racing event held yesterday at the Boston Design Center this past Saturday, May 7th. About 140 drone enthusiasts came to the one day event to geek and schmooze over technology, latest trends, take classes on safety, and talk about the latest in gear, events, and what’s happening in the world of drones and drone racing. One of the biggest draws was the indoor race course managed by BMRC and others. 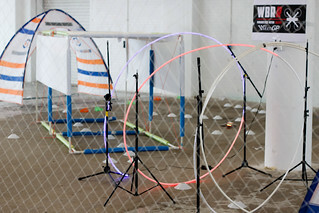 The indoor space was small but the 22 participating pilots made the best of the twisting figure 8 course, running a series of heats and races. The challenge of the tight course made crashes even more of the norm than usual, with many races ending in under 10 seconds as tiny craft get tangled up in the safety netting or have trouble negotiating the mid-course tunnel. This was definitely not a course for full sized 250mm quads! 120mm and 180mm frames ruled the day. 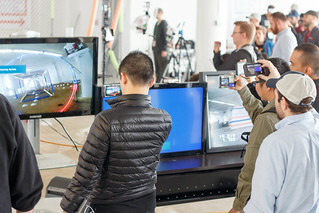 Indoor racing shares many of the challenges other races have, in particular “how can the spectators enjoy the experience as much as the pilots?” – For this event, the organizers set up several large screen TVs showing the video feed from the drones – in essence ‘shoulder surfing’ the pilots, allowing the spectators to see exactly what the pilots were seeing. It gave a great experience to people seeing racing for the first time. Have to give a big shout out to the event organizer Sean Tierney who wrangled the vendors, the space, and all the details necessary to make the event come together successfully.